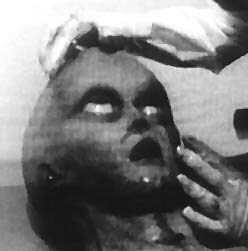 Well, it appears that more and more images from the purported Roswell Film that Merlin Productions and Ray Santilli has are being circulated. So we present this page and a third page, so you don't have to wait to long to have the images downloaded. Thanks to Steve for sharing this, we hope our readers are enjoying the images and again, if you would email us with your comments, we would like to share a new page with people's thoughts. Just thought I'd forward these for your use. I really don't know what to say, as I just got these a few minutes ago. 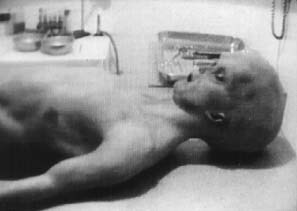 The alien appears to be too "human", but that's a snap judgement based on a bunch of stills. So I should attach .gif and not .uue files? That's why it didn't work: let's try with AUTOPYS1.GIF (and the rest as well in the next three msgs. Keep me posted. You may with to tell colleagues that: a new society (company) emerged from Santilli: photos in French Mags were copyrighted by Roswell Autopsy Footage Ltd: never heard before? - a legal sue is in progress against CISU by Santilli's Italian cohorts: we got a first letter from their lawyer! It will be amusing, we hope, and will keep you informed about it. Santilli's ITalian representative and CUN member Maurizio Baiata went on Channel 1 TV to tell he could not show the pics, but CUN scientific consultant Corrado Malanga explained the ET is not a mammal, rather a bird, since it had eggs in her belly (we videotaped it).